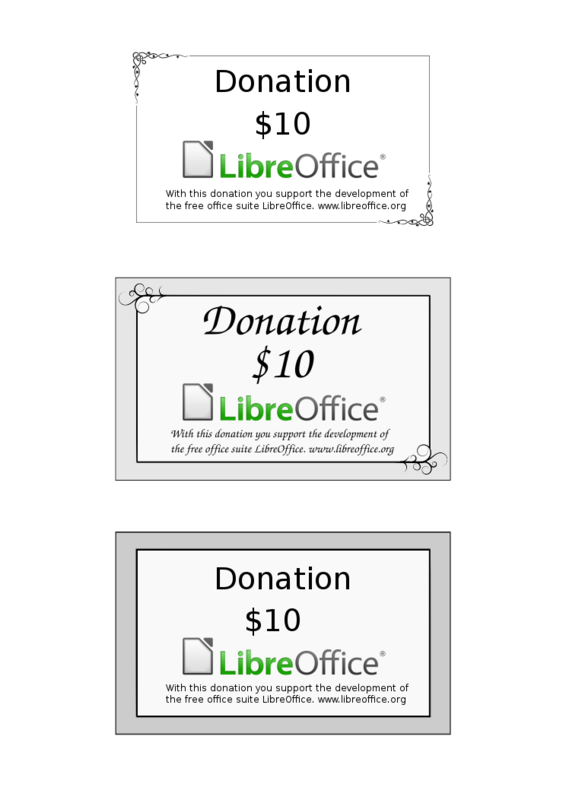 When handing over the card, take the opportunity to tell the receiver about LibreOffice and the Document Foundation. Feel free to change the amount on the cards. The ornaments in the first card was made by OCAL. current 2012-12-21T17:13:59 744 × 1,052 (346 KB) Thomase (talk | contribs) Converted the file to plain SVG (from Inkscape SVG). The drawing was rendered differently in different viewers and browsers. 2012-12-20T17:51:42 744 × 1,052 (387 KB) Thomase (talk | contribs) The new fonts didn't render well when previewed. Changed the text to PNG. This page was last edited 08:19:24, 2016-02-23 by Dennis Roczek. Based on work by Thomas Elfström.